A friend of mine sent me this article from the the Westlake Picayune. Mikala Ulmer, a first-grader at Trinity Episcopal School in West Lake Hills, will be selling her special, award-winning lemonade Sunday from noon to 3 p.m. at a stand on the corner of Sixth Street and Lamar Boulevard. Mikaila will donate 20 percent of the profits from her lemonade sales that day to the Texas Beekeeper’s Association to help save the honey bees. I’m going to try my best to get downtown to buy a cup. 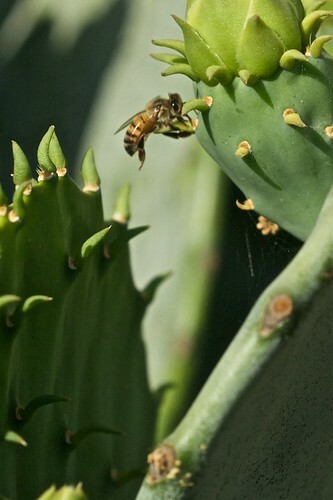 The cacti are blooming in Austin right now, and the bees are loving it. 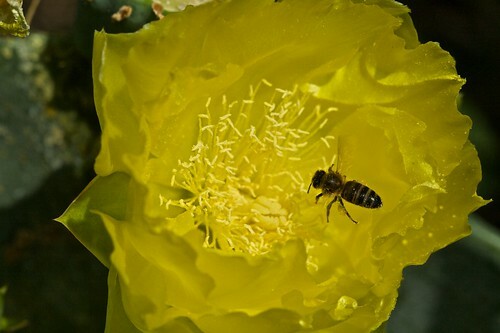 The flowers are full of pollen, and the honey bees are taking advantage of it. 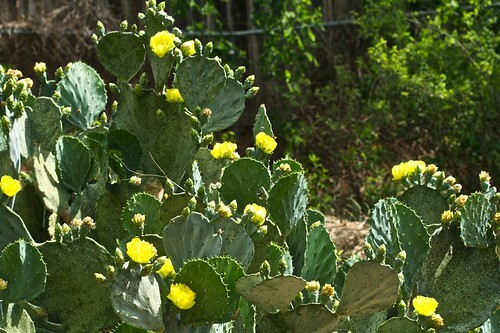 The native bees really seem to enjoy these blooms the most. 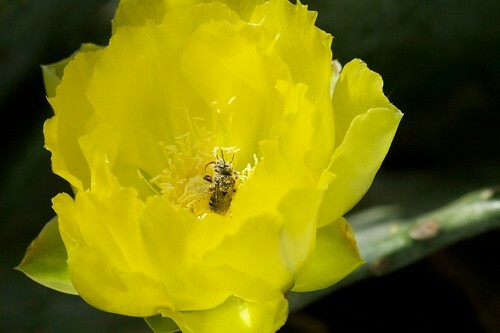 They really get down into the flower and get covered with pollen. I also checked Large Marge’s hive this weekend, and I think it is going to be the last inspection for a few weeks. 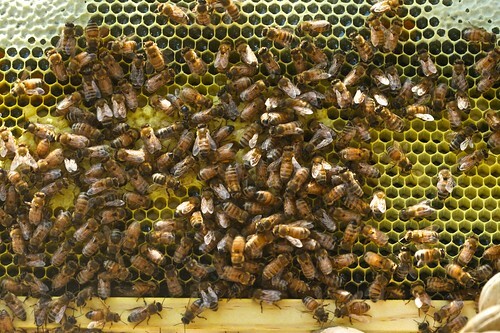 Her hive has been so big and vigorous, I just figured it was going to swarm, but I don’t see any evidence of queen cells that would indicate that. 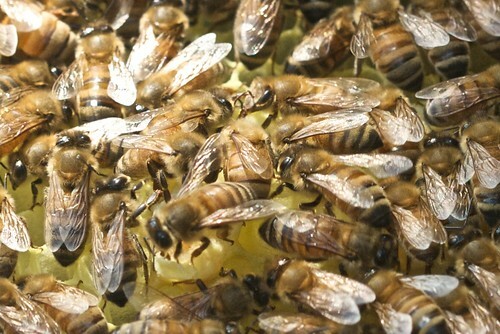 She still has a great brood pattern and, even with this drought, they are managing to still stock away honey. It has been two weeks since I first hived the new package of bees and a little over a week since Ramona was released from her cage. 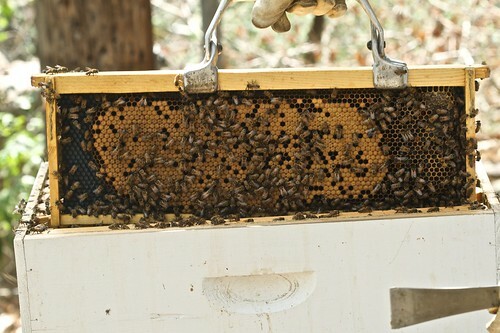 The girls have been busy drawing out wax even in areas like the hive feeder. Once I got into the hive, I was a bit nervous on how Ramona was doing. 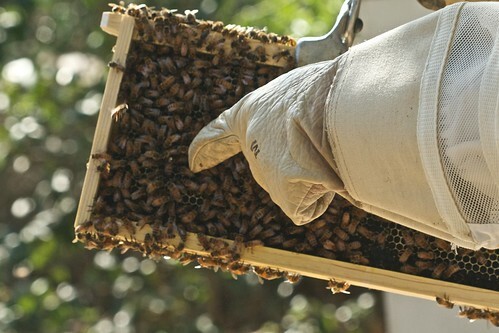 A good chunk of the comb is filled with the syrup and they are starting to cap a lot of it off. I really don’t want the hive to be honey bound and not have anywhere for Ramona to lay. 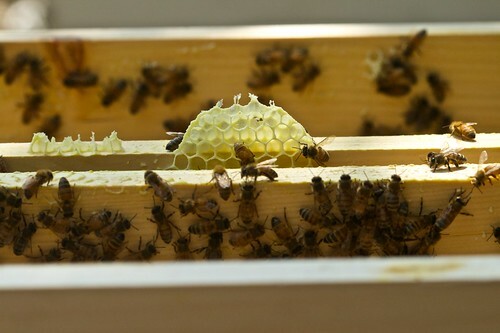 I did see one or two frames with eggs, larvae, and capped brood so maybe she is just starting to hit her stride. I did see a few cells with 2 eggs in them which usually indicates a laying worker if you find them in large quantities. I only saw a handful so I’m hopeful this is normal for a new queen. We did see Ramona so we confirmed she was still there. The thing that has me the most worried is a possible supersedure cell in the picture below. 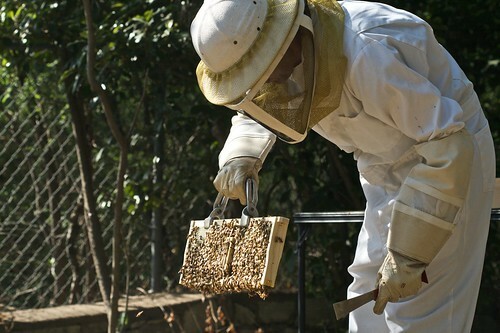 It was covered in bees, in the middle of the frame, and was hard to see clearly. I have a shot below if any one wants to weigh in with an opinion. 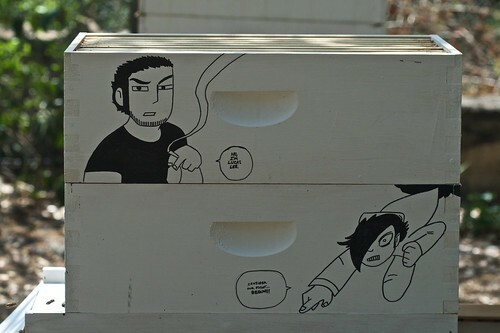 I know Ramona is alive and is starting to lay, but the bees know better than I if she is up to the task. We’ll see what it looks like next week, but who knows, Queen Ramona II may be just around the corner. Finally, as the girls have pretty much filled out 7 of the eight frames, we added the 2nd Evil Ex Super to the hive. This post is extremely late as I inspected the new hive last Saturday, but work has all but consumed my life for the past week so I’m just now able to take a moment and give an update on Ramona. Last Saturday, I did a quick check of the hive to make sure Ramona had been safely released from her cage and was out and about in the hive. Here is a shot of the frame with the cage still attached by a rubber band. I forgot to bring scissors so I had a heck of a time getting the rubber band off without hurting bees in the process. Luckily, my hive tool did a good job cutting through the band. After a few minutes of searching, I finally spotted Ramona. She has a white dot on her back. 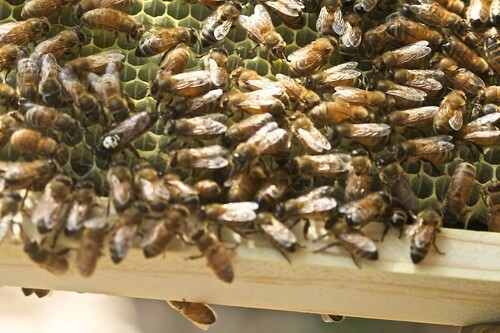 The girls are drawing out comb nicely, and I will most likely need to add a 2nd super to the hive this weekend. The girls are also really sucking down the syrup as Austin is in the middle of a pretty bad drought right now. I can’t even remember the last time we got any decent rain which is a complete 180 from last year when I started Large Marge’s hive. 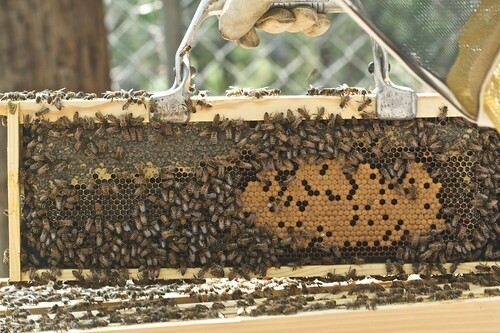 I performed a quick check on the top feeder in Ramona’s hive. The girls had sucked it dry so I filled it up again. I really meant to visit on Wednesday, but work unfortunately got in the way. This should see them through the weekend when I’ll check to see that Ramona has been released from the queen cage.